Anyway, one of the challenges that I face in scrapping is stamping and embellishing gone wrong. Given the limited supplies I have here, I have to be really innovative about pieceing together stuff for challenge sketches. 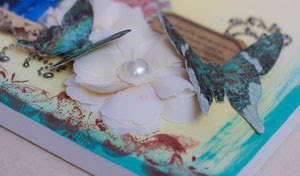 I wanted to use flourishes chipboard but I ended up using my stamps to create the look. Then I couldn't find a suitable ink color. (And the new ones I have ordered were still not here, thanks to an over zealous receptionist here which is another long story). Anyway, I ended up using the crystals and faux pearls to cover up the stamping mistake and the end result turned out so 'bling'. Also, the little blue owl at the bottom, was a decorative piece for Adah's croc shoes which got pried out of its attachment by Asher. Love the ribbons that I have used, my best buys from the ribbon market here and there was no place for more journalling, so I had hidden journalling behind the pictures that I have attached on with a brad. 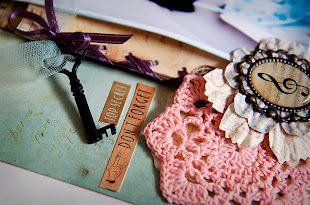 I came up with this for Creative SCrappers Weekly Sketch Challenge #26. When I first started, I wanted to follow closely to the sketch design. I had a floral concept, butterflies, layering and all. But I found these running pictures of the two monsters, and I really want to scrap them. I still tried to stick to the original theme that I had in mind, but maybe use more browns, blues and greens since these colors are more neutral. Well, in the end, as I played around with ideas, the layout turned out the way it is. No flowers, no fluttering butterflies, no flourishes...Probably will try again my floral theme with some other pictures. I really like this sketch design for multiple pictures. These are my favourite pictures of the two monsters at play. I dun have a 'professional' type of camera, just a regular digital camera- Panasonic Lumix DMC-FX07 that hubby bought for me as a gift before we flew over to Shanghai. (Lookign back, it must be a bribe!) Given its speed, I was so happy when I managed to get these 3 pictures in the midst of pacifying Adah and then telling Asher off. I was trying to get them to pose lovingly for the camera when the jostling started over a bowl of apples. 3) She's down but still no apple! 2) Didi wants my apple, RESIST! 3) I'm down but I still have my apple. Ha ha ha! Adah was blessed to have a very wonderful English teacher in K1. I have not met such a dedicated, patient and loving teacher and I am quite sure the other parents who knows her will think so too. Unfortunately, she only taught Adah for one month before health reasons and personal issues led to her resignation. I put together this mini album for her. I was so touched when she made cards for each and every child in her class. She made sure she had photos taken with all of them and they all had a copy to keep to. I had named it ' A teacher's diary' and left some pages empty so that she could put in her own memorable photos. With no photos, it can be really difficult to create something out of nothing. This is the gift that I made for Lily for her 3 year old birthday. Lily is Adah's best friend. The two girls were almost inseperable when they were in the same class. There are times when they just can't get enough of each other, begging to go to each other's house to play after school. But within spilt seconds, they start quarrelling. Before the mothers can gather themselves to seperate the girls, they start chirping and giggling away again! Honestly, as expats, people come and go in our lives. At one stage, I was sending off 3 friends in a month! I really wanted something for Lily to remember her little best friend years down the road. 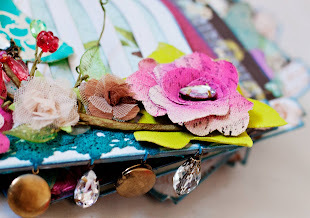 She's such a girly girl and I found this Maya Road handbag chipboard album for her. The challenge from The Story Matters is themed on being THANKFUL. This is indeed a timely reminder that we should all be thankful as we approach the end of the year. Another year flies by and we are hopefully another year wiser, but with the financial crisis and bad news everyday, all I hear are complainings and grumblings. The hubster warned that his bonus will definitely be cut and is sad that his hard work in the initial part of the year during rolling good times is probably down the drain. I receive smses from my banker friend worrying about her customers and relationship managers... ...and even the young gal at home complains that she can't get to see her favourite uncle and auntie all the time. I am indeed thankful for everything God has blessed our family with. The kids, Papa's job (his bonus may be cut but he's not jobless) which allowed me to stay home (and watch the monsters grow), the quarrels which strengthen us, the laughter and the joy! I really like this theme cos' its so meaningful, so i'm submitting it for So Tell Me Your Story challenge as well! I like this blog. Go check out this blog, it has simple and meaningful themes for challenges. Personally, I like the 'All About Me' challenges cos so often, we get caught up in scrappin about others but never about ourselves! This is my very first project- a 'scrapped' wedding album for my brother and his wife, SJ. Both of them dotes on the two monsters a lot, especially Adah. They helped to take care of Adah during the days I was alone in Singapore, during the 2 months when the hubster first came over to Shanghai. This is really a token of appreciation for them and my brother whom we have always regarded as a small boy. He's finally grown up now, with a family of his own. It was no easy feat rushing through 22 pages of layouts in just 3 weeks. Thanks to Asher who came down with a high fever and ear infection, I stayed awake for several nights and managed to rush through a number of pages. I was too afraid to fall asleep cos' I wanted to check on Asher every hour. You can tell how 'raw' my works were then(and probably still are)... ...but it was really fun putting the album together and showing it off later!